Cleveland Browns quarterback Baker Mayfield (6) celebrates after leading the team to a 26-18 win over the Cincinnati Bengals at FirstEnergy Stadium in Cleveland on Sunday, December 23, 2018. Another day and another movie trailer previewing the 2019 Cleveland Browns season. CLEVELAND — Cleveland Browns fans have not had much to cheer about in recent seasons, but times, well, they are a changing and the faithful are excited about the recent additions to the roster, namely Pro Bowl wide receiver Odell Beckham Jr.
For the second time in a week, the Browns were featured in a parody for an upcoming “Avengers” movie. This time around, the “Avengers: Endgame” trailer chronicles the struggles of the past and the hope for the future. From Bottlegate to Dwayne Rudd’s helmet toss that cost them a season-opening win against the Kansas City Chiefs in 2002 countless blunders against AFC North Division teams and a long lineage of quarterbacks, the Browns’ struggles are well documented. 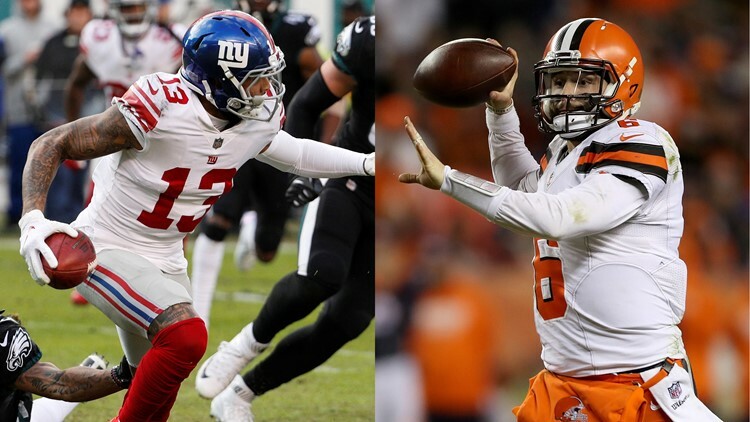 But so was the unlikely rise of rookie quarterback Baker Mayfield and the fact that he led a team that was 2-5-1 and in the midst of an unprecedented mid-season coaching upheaval to a 7-8-1 record and kept the Browns in the playoff chase through Week 15. Then, the Avengers vowed to finish the mission to save humanity. “Even if there’s a small chance, we owe this to everyone who’s not in this room to try,” Black Widow said. The latest Browns-themed trailer followed two others in recent days, including a Disney parody and another Avengers preview. Several local fans combined their talents to write, produce and edit a parody video of the song, “A Whole New World” from the Disney classic, Aladdin. Entitled “A Whole New Land,” the video has actors portraying Mayfield and Beckham Jr. on a magic carpet ride through Cleveland. Over 59 regular-season games, including 56 starts, in five years with the New York Giants, Beckham Jr. turned 622 targets into 390 receptions for 5,476 yards and 44 touchdowns. Beckham Jr. averaged 92.8 yards per game, including a league-best 108.8 during the 2014 season. A three-time Pro Bowler, Beckham Jr. has put four 1,000-yard and three double-digit touchdown seasons on his resume since being selected with a first-round pick in the 2014 NFL Draft out of Louisiana State University. Last season, Beckham Jr. turned in a 77-catch, 1,052-yard, six-touchdown effort for the Giants. A Cleveland Browns fan used his talents to create an Aladdin-themed parody video for quarterback Baker Mayfield and wide receiver Odell Beckham Jr.
Mayfield broke the NFL rookie record with his 27th touchdown throw of the 2018 season with 3:24 remaining in the fourth quarter of a 26-24 loss to the Baltimore Ravens in an AFC North Division clash at M&T Bank Stadium in Baltimore on December 30. After taking over the first-team offense in the second quarter of a Week 3 win over the New York Jets, Mayfield completed 310 of his 486 attempts (63.8 percent) for 3,725 yards and 27 touchdowns against 14 interceptions. Under the direction of new Browns coach Freddie Kitchens, who was the interim offensive coordinator for the second half of the 2018 season, Mayfield completed 180 of his 263 attempts (68.4 percent) for 2,254 yards and 19 touchdowns against eight interceptions.